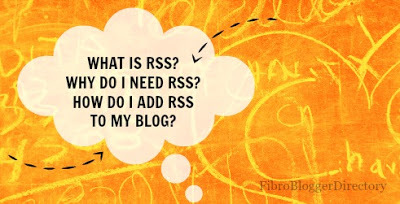 Fibro Blogger Directory: What is RSS and how to use it? Understanding RSS is complex so here I will try and simplify it for you. RSS is a technology that is being used by millions of people to keep track of their favorite sites. Really Simple Syndication is what it stands for. An RSS feed is like a personalized newspaper. It is a way to get a quick list of the latest story headlines from all your chosen sites all in one place. An RSS feed is usually marked with an RSS icon that might look like a square with lines in it. You can see one at the top left column of this site. The RSS icon means a site has an RSS feed and means you can subscribe to it using a feed reader. Software sometimes named "RSS reader", "aggregator", or "feed reader", sends information to users when they sign up. Most blogs have an RSS feed which is detected automatically by commonly used feed readers when the blog URL is added to the reader. WHY DO I NEED RSS? When you subscribe to an RSS feed you can review a large amount of content in a very short time. A feed reader will display your feeds and the number of unread entries in the feeds. If you have a blog then a feed gives instant distribution of your content for people to subscribe to. You can offer a feed of your content as an option for your readers. If you are using a popular blogging platform or publishing tool like Wordpress, or Blogger, your feed should publish automatically. Feedburner is a free web service which helps bloggers and podcasters to manage their RSS feed and see how many subscribers they have. You can add a Feedburner RSS feed and also an email subscription to your blog as I have done at the top of this site. It only took about 3 minutes to set it up. This makes it easier for readers to subscribe using RSS, and also allows you to know exactly how many people subscribe to your blog. Once you set it up you do not need to do anything else - just keep posting to your site. I hope this has helped you understand a little bit about RSS and I would love you to leave a comment and let me know if it has. If you are an RSS feed user I would love to hear which one you use. I told you I have an RSS feed you can subscribe to at the top left of my page but if you don't have a reader I also have an email subscriber there too which means you will receive my new blog posts as an email. Great info for all bloggers to have. Thanks Celeste, a few people had asked about RSS and the info in the blogosphere was scattered and difficult to understand. Thanks Ria, for letting me know. Glad it helped.